Against a glorious backdrop of iconic London landmarks, the white tents of this year’s Chinese Food Festival stand strong in the midday blue. Nestled in between City Hall and Tower Bridge, over three days the collection of 18 stalls were swamped by enthusiastic Londoners, and amassed into a truly exquisite celebration of Chinese food and culture. 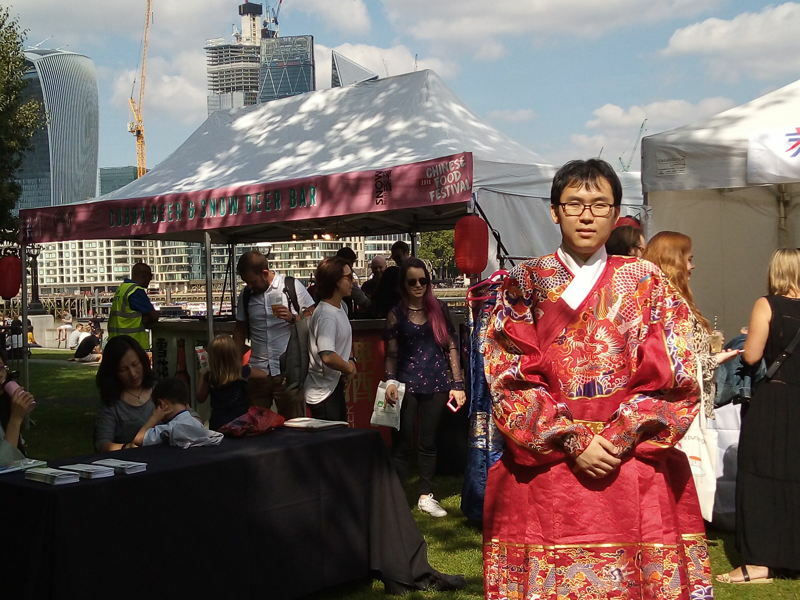 Held at Potters Fields Park, the festival, now in its fourth year, is only three kilometers down the Thames from the East End location of London’s original Chinatown, Limehouse. Populated by Chinese seamen in the 1880s, Limehouse became the epicentre of the first Chinese community in London - long before the iconic Chinatown in Soho was born. And it is with this sense of returning to authenticity that Shi Tang, one of the festival’s co-founders, says the food festival was founded upon. ‘Before [Londoners] were only eating Cantonese’, Shi claims, ‘we wanted to bring authentic Chinese cuisine to the world’. Certainly, the array of food on offer is as varied as the immense country the festival seeks to represent. Seven different cuisines originating in as many different Chinese provinces provide London’s foodies with a whistle-stop tour of some of the best dishes China can offer: from Yunnan’s Crossing-Bridge Rice Noodle (a delicious noodle soup brought to Britain by the brand Yun), to the sweet Taiwanese Wheelcake. A soft, fluffy pancake-like creation, the Wheelcake is a traditional Taiwanese snack filled with a gooey, creamy centre. At Wheelcake Island, a company founded by partners JC and Felix, these succulent middles come in such a rainbow of mouth-watering flavours that they became a joy for festival-goers to watch as well as eat. Aside from looking back to its Chinese origins, however, the festival is also a landmark for modern Chinese cuisine in Britain; for experiments with fusion and flavour that stretch away from more traditional methods. Take the sensational restaurant and street-food sellers Ugly Dumpling, who sold out every day of the festival with over two hours remaining. Former student of School of Wok and founder of Ugly Dumpling, Ping, explains that her products are markedly ‘different to traditional Dim Sum’ due to their ‘more Westernised’ fillings. As well as take-away favourites aromatic duck and chicken satay, flavours of dumpling served at the Newburgh Street restaurant also include the refreshing halloumi and pepper, and vegan fashion-of-the-moment - jackfruit. And then there’s us! Over two days at the Chinese Food Festival, the School of Wok hosted 11 classes of wannabe wok-stars who, under the guidance of our superstar chef Heather, used the new School of Wok Bao Bun kits to produce hand-made fluffy bao in only thirty minutes. Traditional bao dough can take over three hours to prove; by using an accelerated starter in the bao flour mix to ensure the dough rises in a fraction of that time, School of Wok’s Director, Jeremy Pang, has devised a product that allows the time-pressured families of today to still access high-quality, traditional Asian cooking in their homes. This was tried and tested at the Chinese Food Festival, and each of our new students left the Lee Kum Kee kitchen tent laughing, with flour in their fingers, barbecue glaze on their tongues and a new skill and free lunch to boot. This marriage of tradition and modernity is exactly what sets this festival apart. For one weekend of the year, in the heart of central London, dancers in traditional Chinese dress waft ethereally through throngs of people drinking bubble tea, while iPhone grasping teenagers learn to throw arrows into a vase (all courtesy of [UK Han Culture Association] (https://ukhancouk.wordpress.com/). Friends, families and partners of all ages can come together to Learn (about Chinese culture and cuisine), Laugh (at their flour-covered comrades), and most importantly Eat (exquisite food).